Projects will include cooperative art, age appropriate skill development, self-exploration, art play, vocabulary development and experimentation with materials. We will sometimes strive to make pretty pictures, and otherwise focus on exploration and allowing the children to do things on their own. I will continue to develop project ideas throughout the term. September is “All about Me!” new friends, and clay! 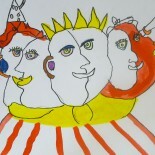 Step by step finger painting and drawing : kids, faces, insects and animals. Learn to paint fast cars ( making shapes and fine motor skill development). October Autumn leaves, pumpkins and apples. Cooperative art projects: Fall Quilt Mural & a Friendship Wreath. Simple drawing, tracing & colouring exercises. Printing with corn on the cob, potatoes and other fall vegetables. Make pinch, coil and slab pots with toddler friendly modelling clay. This entry was posted on July 18, 2015 by mslambert in Early childhood activities.